Get your dream dress for less at Orlando bridal warehouse. Our gowns are sold off the rack at deeply discounted prices. In addition to gowns we also offer a line of bridesmaid dresses, as well as Quinceañera dresses for sweet 15 celebrations. Don't see your desired appointment time? Give us a call at 407-933-3464 and we'll see if we can accommodate you. At Orlando Bridal Warehouse we specialize in selling designer and overstock wedding gowns and dresses "off the rack". which means you can find your gown and take it home today. We source our gowns directly from the manufacturers we get them at a discounted rate and pass the savings on to you! Orlando Bridal Warehouse has over 1000 in stock dresses ready to purchase and take home today. All gowns are available with savings of up to 20-80% off retail! Our store offers a no pressure, friendly relaxed environment. We are a self service warehouse type of setting. We will let you browse, try on and help you zip up if you need help. We will save you 100's of dollars and you will still find your dream dress. Along with bridesmaid and mother of the bride dresses we also carry veils, jewelry, tiaras, and accessories. We've added a line of Prom dresses for 2018. Now you can find the latest designers and trends at Orlando bridal warehouse. Off the rack designer gowns at deeply discounted prices. Tons of styles and sizes to choose from. 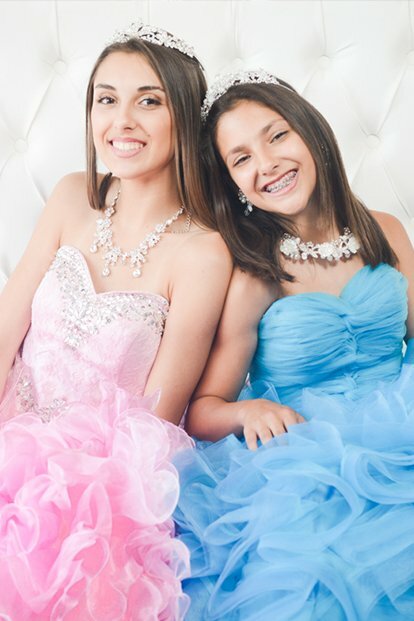 Our line of Quinceañera dresses are sure to be a hit during your big day! Our Bridesmaid dresses are perfect for the entire bridal party. Compliment the wedding party's colors with a beautiful Mother of the bride dress. Find the hottest designer prom dresses now at Orlando Bridal Warehouse. Find the perfect accessory to complete your look.